Today I was on the metro and heard an older woman being horrible. I had to physically turn the other way to not get angry and as I did, I immediately saw a kind face. I decided to focus on that instead. There is a little bit of ugliness in the world, but the vast majority of it is incredibly beautiful. I would rather spend my life celebrating the beauty. It is so strange to receive news about death over Facebook. You read a status update which has a name, which is linked to a profile. You click on it, sift through pictures, see public status updates. Where was this person last tagged? What was the last activity they had? And as you process this information you have five or six tabs open in the same window. Your eye wander around to see if you have any new emails or any notifications. They glaze over the ads for grocery stores and home furnishings. I counter this to the only memories I have of learning of death as a child. When you have family overseas, you learn to dread that phone call that comes in the middle of the night. I can imagine the feelings my parents had from the moment they heard the first vibrations of the phone ringing. The terror and dread that must have passed through their bodies. The questions that soon followed. Whose family was calling? Whose life was about to be forever changed? Already, the world was different and in seconds that information would be conveyed through the wire. Then, there is a voice, maybe filled with sobs, maybe filled with compassion, but there is someone there to witness and to share the pain. The world changes and we along with it. Even though we may now learn about one of life’s most brutal truths through a cold, detached medium, it does not mean that we must have a cold, detached response. Initially, I found it so difficult to close my eyes and say a prayer for the person’s name I read on Facebook. There were so many things going on my screen and I was quickly becoming distracted. But I stopped myself, I took a deep breath, closed my eyes and I prayed. I prayed for this woman, her young family and I prayed that as technology’s reach spreads over our lives, we adjust with it in a way that is compassionate and human. How to win an election in one step: Create a parody of this video with yourself as the lead. You’re welcome, Barak. I signed up on CouchSurfing.org years ago when I wanted to go on a solo trip to Iceland. My roommate Cyan had been a host and I thought it would be a good way to make some friends while I traveled. The website connects people who need a couch to crash on and hosts that want to help out travelers. There are also options to list yourself as being available to meet up for coffee or hang outs. As I was planning my trip to Konya, I thought it would be fun to give it a try. I emailed three people and within eleven minutes, Gulcan replied. We coordinated and soon I was all set with a place to stay the very next day! Gulcan was so sweet and even picked me up from the bus station at 6 am! (You can book a ticket at the Metro office in Taksim for 65 TL each way and the Metro office provides you with a complimentary shuttle to the buyuk otogar.) My time in Konya would not have been half as fun if I hadn’t stayed with Gulcan and her mom. To read more about the trip, click here. Gulcan’s mother prepared this lovely breakfast for us on my first morning there. Huuuuge tray of borek that Gulcan’s mom made. Grapes growing on Gulcan’s balcony. I can’t believe I am back in DC for the time being. Everything feels so big and clean. From London, to Newport, to Birmingham, to Istanbul, to Konya, to Tbilisi and then back to Istanbul, every single part of the last five weeks was amazing in its own way. I will try to write as much as I can about it over the next few days but I expect I’ll be posting more pictures and less reflections. I guess we will have to hang out in real life if you want to hear the stories! As you know we started the trip out in the UK. We ended our time in the UK in Birmingham. Doing Ramadan and Eid in Birmingham were on our bucket list and they did not disappoint. We got to catch Liverpool’s season opener agains West Brum while in Birmingham. We had first row tickets to their beating. It was so hard to watch. We first went to Birmingham in 2009, then again in 2010 and this was our third trip there together. The thing we love the most about Birmingham is that Feraz’s family has made such a wonderful little community there. Everyone is a part of each others lives. There are babies and cousins and aunts and uncles and grandparents. There are not just mostly twenty and thirty somethings like in DC, something that has always bothered us about being here. The Birmingham community has adopted much of the extended family system of back home but everyone still has their own houses. It is a nice balance between wanting some individuality and privacy but still having the benefits of being a part of a really tight knit community. It is not unusual for people to drop over unannounced and most family members seem to see each other at least several time a week. On Eid, everyone came from Wales and London to celebrate. As is typical on Eid, there were lots of presents, food, family, friends and laughter. We are so thankful that we were able to share the day with such amazing people. 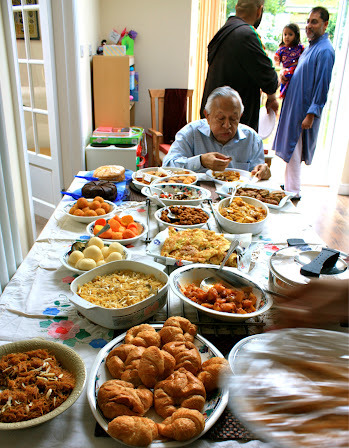 Some of the Eid spread. To see all the pictures from Birmingham, click here. I'm Sumeera. This is where I write about my life. And then there were 4. © 2015 SumeeraDesigns | Made with love by NUDGE MEDIA DESIGN.